As we prepare to send our children off to school we remember to schedule our immunizations, replace the clothes they’ve outgrown and run through the list school supplies; however, it’s easy to overlook our children’s vision. A back to school eye exam is essential to a child’s success. Afterall, over 80% of what a child learns is through what they see yet over 86% of children have never had an eye exam. The link between learning and eyesight is compelling. Eye exams that include a thorough assessment of a child’s vision and ocular health are crucial for children of all ages. Set your child up for a successful school year. Start a great tradition with a back to school eye exam. Poor eyesight can adversely affect a child’s educational performance and social development. The American Optometric Association states that 60% of children identified as having learning difficulties have undetected visual problems. Uncorrected or insufficiently corrected vision leads to an accelerated rate of progression in a child’s nearsightedness. Vision problems affect one out of twenty preschool age children. Untreated visual problems can worsen leading to other more serious behavioral and learning problems. As adults, we spend hours a day looking at our small digital devices; however, our children spend even more time on their digital devices. Time spent on cell phones and tablets have a significant impact a child’s vision, by creating an environment conducive to increasing nearsightedness and an increased exposure to blue light. New technology in contact lenses has made it possible to prevent the progression of nearsightedness in children. Advances in ophthalmic lens coatings now making it possible to block certain harmful wavelengths of light emitted from digital devices and computer screens. The eye doctors at Total Eye Care are experts in determining which of these technologies are best for you and your family. Call Today or schedule your appointment online. Total Eye Care and Optos partner in using scanning laser technology for children’s back to school eye exams. 2010 – In conjunction with “Back to School” time, Dr. Richard Driscoll, an eye doctor at Total Eye Care in Keller and Colleyville, is working with Optos to launch a program aimed at educating parents about the importance of regular eye examinations for children. It is estimated that 80 percent of what children learn during their first 12 years is related to sight, yet unfortunately, 86 percent of children in the U.S. start school without first having a comprehensive eye exam. As parents we often think that our son or daughter has good vision and therefore does not need an eye exam. Common misperceptions of why eye exams in children are not important include, my son doesn’t complain of blurry vision, my child’s grades are good, or the parents have good vision therefore the kids probably do too. School screening don’t qualify as an eye exam. While an essential part of protecting the visual and physical health of our children, school screenings were never intended to replace a professional eye exam. School screenings prevent children from “falling between the cracks” and are best used to supplement regular eye care. Read more about safeguarding our children’s vision. How Should We Safeguard Our Children’s Eyesight? Posted on July 8, 2009 | Comments Off on How Should We Safeguard Our Children’s Eyesight? Is it too early to think about what we need to do to get our kids ready for school? One of the most important “school supplies” is your child’s annual eye exam. Over 80% of what a child learns is through their eyes, therefore it is important for our kids to see their very best. Kids often don’t complain when they don’t see well and we can not rely on them to tell us when their vision is blurry. Blurry vision rarely happens quickly, it happens slowly over time and children and adults alike don’t realize what they have lost because it happens so slowly. On the Total Eye Care website we have more information on the components of a complete eye exam, school screenings and more information on children and vision. So carve out some time this busy summer and enhance your child’s learning with an eye exam. Comments Off on How Should We Safeguard Our Children’s Eyesight? I came across this video from the American Optometric Association about the importance of yearly eye exams. We also filmed our own video about the importance of yearly eye exams at the new Colleyville office . With back to school eye exams being an important part summer it is important for us to safeguard our children’s vision. The Doctors is a TV show carried on CBS featuring four doctors that discuss current medical topics and new technologies. And yes one of the doctors you may recognize as “The Bachelor”. 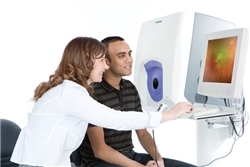 Recently they featured the technology of the optomap® Retinal Exam. Total Eye care is one of approximately 3000 offices nationwide that utilizes this great technology. Check out the video below. For more information on the Optomap Retinal Exam check out the Total Eye Care website. The American Optometric Association and the National Association of School Nurses have come to agreement to promote comprehensive vision care for students to improve a students ability to learn in the classroom. This comes on the heels of a study published in October by Vision Service Plan that showed that most children have not had an eye exam. School screenings, while helpful and necessary, are unfortunately often confused by parents as an eye exam. It will be great to see what the two associations do to promote better eye care and learning in children. Read the entire press release here. Annual eye exams are an essential part of a person’s annual health plan. Along with our yearly physical and dental exam we should remember that our eyes provide a window to the health of our bodies and an annual, dilated eye exam is an essential component of preventative healthcare. See our video below which was produced at our new Colleyville office on the importance of regular eye exams. Most of us learn visually. Children especially are visual learners. It is hypothesized that 80% of what a child learns is through their vision yet 86% of children have never had an eye exam. People often assume a school screening, given by the school nurse, is adequate. Pediatricians also offer visual screenings. Vision screenings, while a helpful and necessary part of school back to school, allow many children that need help to fall through the cracks. A comprehensive eye exam is truly what is needed to preserve a child’s vision. An eye exam involves an assessment of a patient’s refractive condition (nearsighted, farsighted etc. ), ocular health, binocular function (how the eyes work together) and a comprehensive medical and ocular and family history. Timely eye exams can also prevent amblyopia and lazy eyes in children. More information about vision and children is available on the Total Eye Care Website. problem is suspected. Until recently eye exams were recommended for all children before they entered kindergarten. However, numerous national organizations such as the American Optometric Association, American Academy of Ophthalmology and Prevent Blindness America have begun to recommend that your child receive their first eye exam at 6 months of age and then again at 3 years of age. Many forms of blindness or amblyopia (a decrease in vision) that occur in children can be prevented if caught early. Before you take your child to your eye doctor ask them if they are set up to evaluate children that are your child’s age. Not all eye doctors see young children.